For courses in introductory microbiology. Known for its unique and effective art program, conversational writing style, and author-created Video Tutors, the Fifth Edition of Robert Bauman’s Microbiology with Diseases by Taxonomy consistently emphasizes why microbiology matters, especially in health care. The text provides a mobile-friendly, multimedia learning experience, from new in-text Disease in Depth visual explorations to interactive tutorials. In text QR codes allow instant access to an expanded collection of videos, including 15 new Video Tutors and 6 new Micro Matters animated video cases. The widely used MasteringMicrobiology homework and assessment program offers a greater variety of assignment options such as new Interactive Microbiology tutorials, MicroBooster video tutors, Connecting Concepts coaching activities, and more. MasteringMicrobiology is an online homework, tutorial, and assessment product proven to improve results by helping students quickly master concepts. Students benefit from self-paced tutorials that feature personalized wrong-answer feedback and hints that emulate the office-hour experience and help keep students on track. With a wide range of interactive, engaging, and assignable activities, students are encouraged to actively learn and retain tough course concepts. Note: You are purchasing a standalone product; MasteringMicrobiology does not come packaged with this content. Students, if interested in purchasing this title with MasteringMicrobiology, ask your instructor for the correct package ISBN and Course ID. Instructors, contact your Pearson representative for more information. Robert W. Bauman holds a Ph.D. in Biology from Stanford University, an M.A. in Botany from the University of Texas at Austin, and a B.A. in Biology from the University of Texas at Austin. He is a tenured, full professor of biology in the Department of Mathematics, Sciences, and Engineering at Amarillo College in Amarillo, Texas, where he previously served as chairman of the Department of Biological Sciences. He has been teaching microbiology, botany, and human anatomy and physiology since 1988. In 2004, the students of Amarillo College selected Dr. Bauman as the recipient of the John. F. Mead Faculty Excellence Award. His research interests have included the morphology, ecology, and culturing of freshwater algae and photosynthetic protists, the cell biology of marine algae (particularly the deposition of cell walls and intercellular communication), and environmentally triggered chromogenesis in butterflies. His dissertation research at Stanford was on intercellular communication and cell growth in red algae at the Hopkins Marine Station. 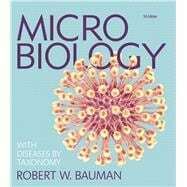 Robert Bauman is the author of another microbiology textbook at Pearson, Microbiology with Diseases by Body System, 3/e (copyright 2012). He is an active member of the American Society of Microbiology (ASM), serving as chairman of the Education Section from 2012-2013, and of the Texas Community College Teachers Association (TCCTA). In 2007, Dr. Bauman initiated an endowment at ASM to fund an annual travel grant for new instructors of microbiology to participate in the ASM Conference for Undergraduate Educators. TODD P. PRIMM is an associate professor at Sam Houston State University, where he teaches pre-nursing microbiology. He also serves as Director of the Professional and Academic Center for Excellence, which focuses on improving teaching and learning on campus. In 2010, he was Distinguished Alumnus of the Graduate School of Biomedical Sciences of Baylor College of Medicine, where he earned a Ph.D. in Biochemistry in 1997. He received a B.S. from Texas A&M University in 1992. He is very active in the American Society for Microbiology and received the Texas Branch 2015 Faculty Teaching Award. He was chair of the organizing committee for the 2013 ASM Conference for Undergraduate Educators, participated in the 2012 Research Residency of the ASM/NSF Biology Scholars Program, and currently serves on the editorial board for the Journal of Microbiology and Biology Education. He is also an affiliate staff member with the international organization Cru. He loves teaching and mentoring students and spending time with his wonderful wife of 23 years and four children.